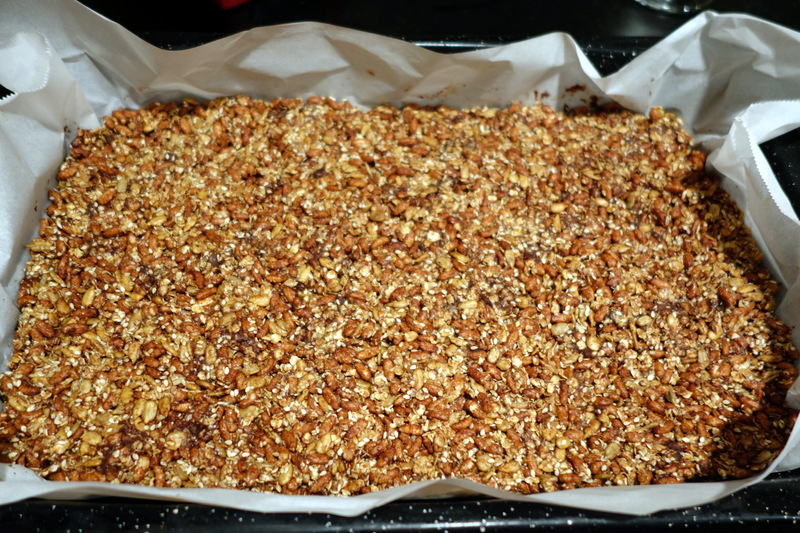 My sister shared this cereal bar recipe with me about a year ago and it’s been a regular at our house ever since. There are so many variations that can be done with this recipe. You can pretty much add anything you like as long as you increase the amount of the rice syrup. One of my friends added Craisins to hers and then drizzled the bars with white chocolate, I’ve yet to try that delicious idea. 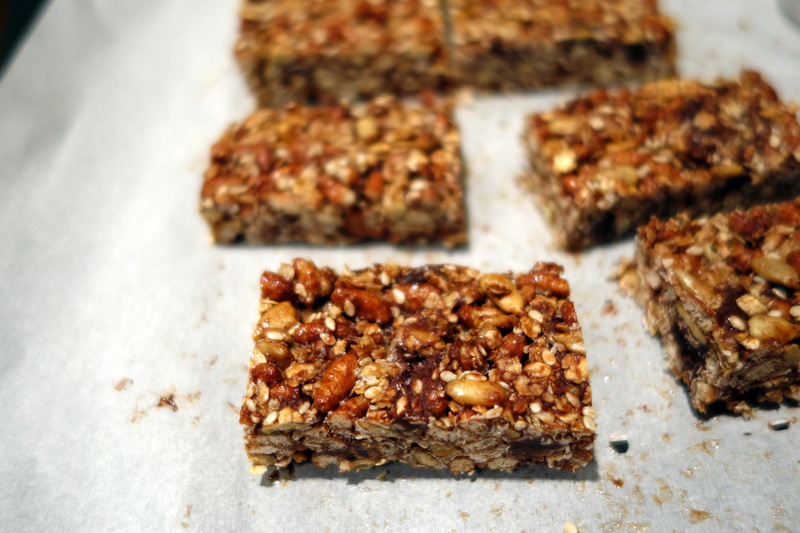 Some other ingredients I’ve added in the past: flax seeds, coconut flakes, cinnamon chips, dried cherries, and prunes. My kids love these cereal bars. (1) Combine the first 5 dry ingredients in a large bowl. 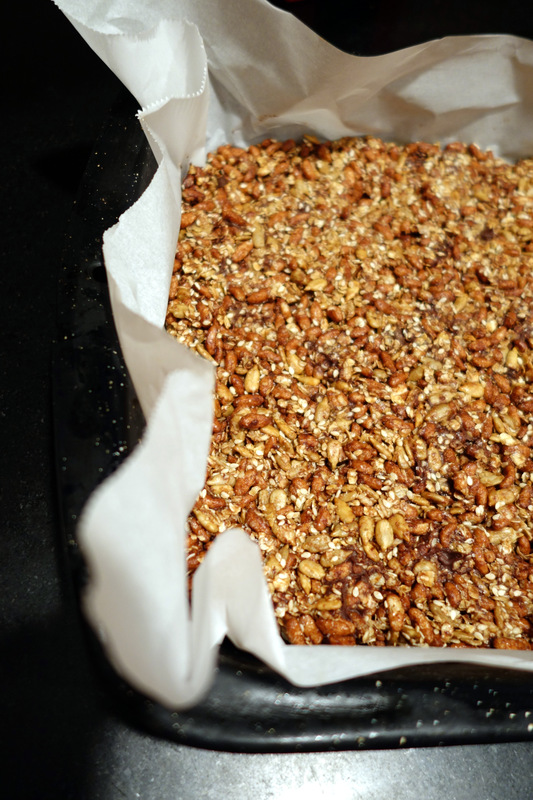 Prepare an 11×15 pan by lining it with parchment paper. (2) Combine coconut oil, rice syrup, brown sugar, cinnamon, and vanilla extract in a small saucepan. Heat this sauce at low-medium heat mixing it continually until the mixture becomes homogeneous and the oil isn’t separating. (3) Pour the sauce over the dry ingredients in the large bowl and quickly begin to mix everything. I’ve had best success with this step when I used my hands to mix the sauce evenly into the dry ingredients. (4) Transfer everything into the prepared pan. Evenly spread the cereal mixture and using your hands or the back of a large spoon pack down the cereal to make it more dense. 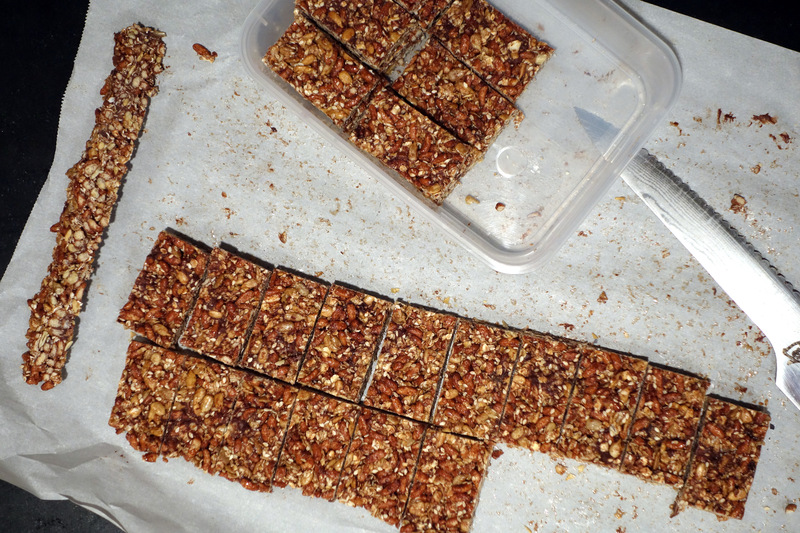 (5) Lightly sprinkle the top with sea salt and refrigerate the bars for an hour to allow them to set. Cut up into bars to serve. Store the bars in an air tight container in the fridge for a week or in the freezer for up to 8 weeks. This entry was posted on November 4, 2015 by natalyaperullo in Uncategorized.